When you hear "Greek Salad" you probably picture chunks of tomato and cucumber, stuffed grape leaves, kalamata olives, onions, and peppers. I do, too! However, there's a different, less well-known (at least in the U.S.) Greek salad that is actually my favorite: the Prasini Salata is packed with green lettuce, fresh dill, scallions, and feta. And it is as amazing as it sounds. I've taken that traditional combination and added some cucumbers and red grapes. I love the crunchy texture the cucumber adds; the sweet, juicy grapes provide wonderful balance to the earthiness of the lettuce and dill. In a screw-top jar, combine the oil, lemon juice, vinegar, honey (if using), and salt. When seasoning the dressing, keep in mind that the feta is quite salty, so make sure not to over-salt. Shake well until combined. 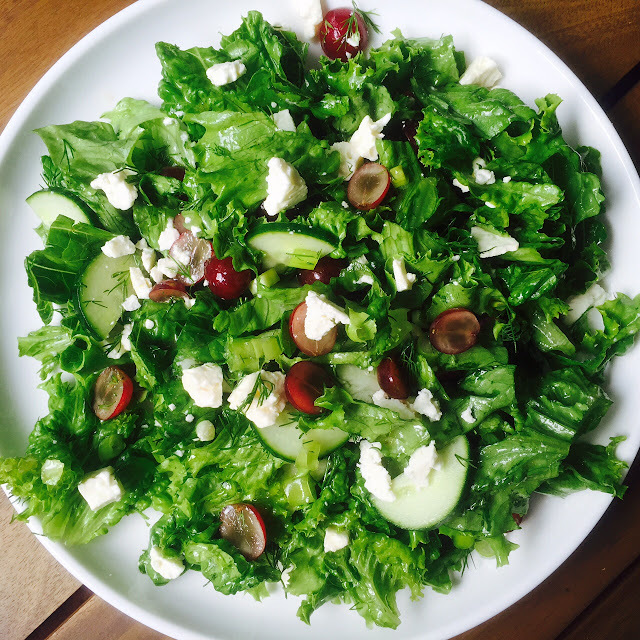 Combine the lettuce, dill, scallions, cucumber, and grapes in a large salad bowl. Drizzle the dressing over the salad and toss well. Add the feta and toss again. Serve immediately. I love how you can have a variety of green ingredients—the lettuce, dill, scallions, and cukes—that all lend their own flavor and texture. The briny, creamy feta and the crisp, sweet grapes are a fantastic complement to this verdant salad. Of course, each of these ingredients is packed with nutrition, so that's a bonus! 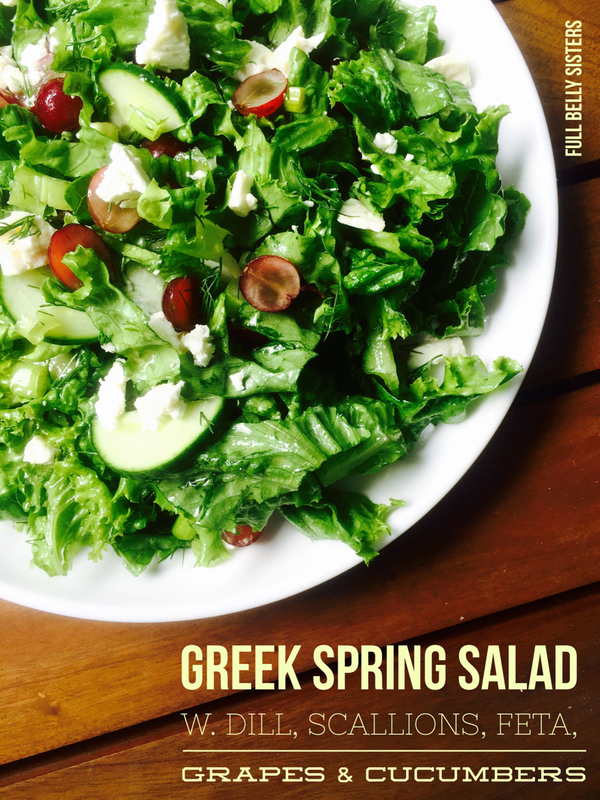 This Greek-style spring salad is often served at Easter, alongside the traditional roast lamb. I recently brought the salad to a good ol' American barbecue—served alongside sausages and burgers—and it was a hit. I also love to have a giant bowl of this as a meal; it's a wonderful summer dinner. Do you love Greek salads as much as I do? Have you ever tried a Prasini Salata? Yum! I love salads, and especially Greek Salad! Can't wait to try this one! So glad you shared it with us at #FoodieFriDIY! Beautiful salad and pictures! The addition of grapes are marvelous! I ate this tonight. It is crunchy and delicious and refreshing and bright!! 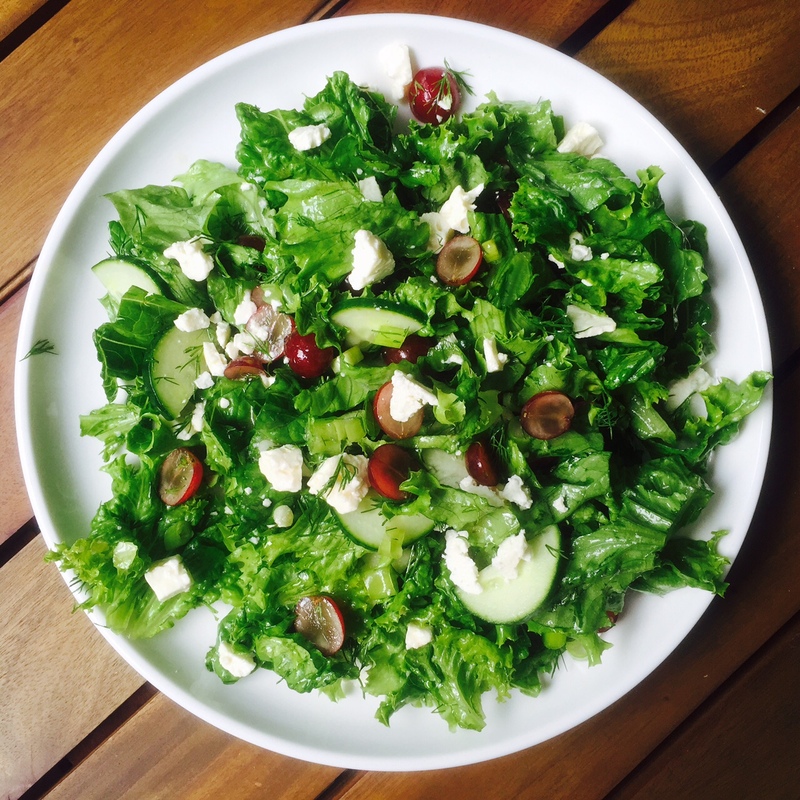 I adore Greek salads and make them regularly...I can't wait to try yours! yum! dill and feta are two of my favorite salad toppings! This is my kind of Greek salad, love the dill and love the light dressing. That's a lovely salad full of my favorite garden greens. Love the grapes and feta in there too! Apart from the classic Greek salad, which doesn't contain any greens, we do eat a lot of green salads too here! I love your twist on the classic! Haha, I always get a little nervous putting a twist on a classic—but sometimes it's too good not to share! I love salads, and eat them almost every day! I can't wait to try this one! Thanks! Awesome, hope you like it. Greek salad is on of my favorite things so I am a rather happy bunny at the moment drooling over this. And I'm happy to read your comment! 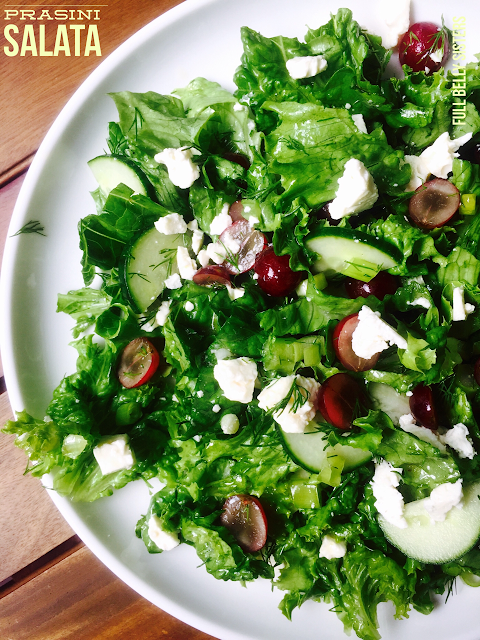 I love Greek salad - the flavor contrast between the sweet grapes and the feta cheese make this a winner for me - so yum! My wife would totally love this salad. I love a great salad and this one sounds amazing!! Love all the flavors, textures and colors you have added :) Gorgeous!! I haven't even had breakfast but would dive right into this delicious salad, YUM!! Haha, I've been known to eat salad for breakfast! Dill, Scallions and Feta. Fantastic tasty combo. Looks beautiful as well. I love adding fresh herbs to salads, it really makes the flavor pop. Your salad looks amazing! It really does, it's a whole other level of flavor! I love green vegetables. Easy, fresh, simple and lovely salad!